Old world elegance meets 21st century technology to create the ultimate home office. Custom designed to reflect the client's style and personality, the cabinet has several 'secret compartments' scattered throughout its interior. 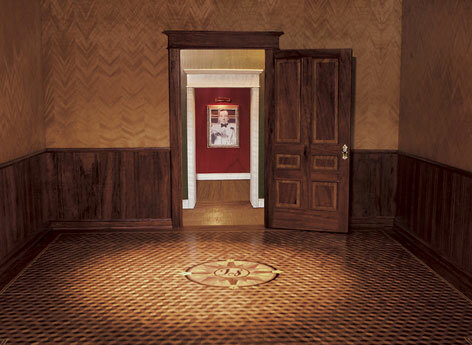 The main compartment comes complete with simulated marble columns of spalted maple, an inlaid compass rose in the center of a Lilliputian-scale parquet floor made of more than 5,000 individually fabricated pieces of wood, and dollhouse lighting to illuminate the trompe l'oeil bas relief decoration beyond the paneled door.